This work postulates a question over the route of individual identity in the digital age. 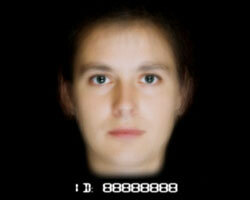 Numerous faces and identification numbers merge in a fast and infinitive succession, generating an anonymous image of a unique human being. By merging different portraits peculiar signs of identity get eliminated, and at the same time the notion of human as a conjunction of different individuals get reinforced. The vortex from which this essential image is generated metaphorically names the speed as the factor under which the identity in the post-biologic era is subjected and defined. Janez Janša resides in the depth of the physical and the surface of a digital representation of the body. In his recent work he themes the video-body in the same way as we treat the data one. If our data body in data spaces is submitted to identical complications as our body in physical space, and we need to make our data body conscious with the same attention as the physical one, Janša points at the representation in video space, which is a privileged space of electronic and printed media. In the work ID:00000000 (ID stands for identity number), Janez covers the picture of the face with other pictures of faces, which are photographed identically so that the centre of each face stands on the same place. Janez produced twenty-five composite faces out of thirty-nine images, and they exchange each second. The video produces the impression that we see one face, which is blurred, and we are not sure whether we see the video spot or a blurry photograph. The digital counter id displayed on the monitor, however, we can't read numbers, since they change all the time and seem like a number eight, a kind of an abstract number. The question of identity emerges through the image of the face, which consists of the series of photographs. It is the domain of ideological fights in a consumer society that tends to create the appearance of how perfect it is. Such flattening of individuality and personalisation happens on various levels. The creation of aesthetic norms in the field of imaginary presents manipulation with attributes of beauty, happiness, success, novelty ... Which all promise and command that our everyday actions must be evaluated in relation to these ideals. Consumers' mechanisms suggest how to reach these ideals. Janša's image can be observed from two perspectives. The first is the image of a static average, where individuals are reduced to a mere number or target group, they are depersonalised and comprehended as a group, or sum. The second perspective of the same image is the procedures of idealisation, where all facial distinguishing features are blurry, and the face is reduced to facial elements without any distinguishing features (a nose, eyes, a mouth). Such image matches modern ideals of beauty which depersonalised facial lines to mere clichéd features. Depersonalised faces gaze from the billboards, not tending to attract attention due to distinguishing feature. The message mustn't be disturbed. Such a face represents the avatar of a message. the First International Biennial of Buenos Aires (Argentina) in December 2000, where it was included in the international video art section curated by Rodrigo Alonso.